A young television reporter in Hartford, Connecticut, U.S.A. found out the hard way that thinking ‘outside the box’ can come at a tremendous price — even if one plays by the rules. On Saturday morning, February 1, 2014, 29-year-old Pedro Rivera was at home with his young family, about to enjoy a day off, when he heard something on his police scanner about a car crash. He noted the address: Main and Capen Streets, in the downtown. Hartford, with a population of 125,000, is the historical State capital. For 17 years it was the home of author and humorist Samuel Langhorne Clemens, a.k.a. Mark Twain. All reporters — especially part-timers — want to show what they’re made of, and Mr. Rivera was no exception. He skipped breakfast, bid his wife and infant son goodbye and made a beeline to the scene.Translation: Rivera wasn’t waiting for a news release to land on his desk. The intrepid reporter couldn’t get near the crash because police had cordoned off the area. Rivera didn’t need to get too close, however. He could be a block away and still do his job. That’s because the journalist had a small, remote-controlled quadcopter — a quiet, battery-operated machine equipped with a high definition [HD] video camera. It’s a fairly inexpensive device every radio, print and television newsroom should have. The reporter could tilt the built-in camera and actually see what was being video-taped in “real time” — all from the screen on his smart phone — in his case, an iPhone. From 150 feet up, Rivera was able to get a birds-eye view of the crash scene. Rivera was unaware, but in the wreckage was the body of a male passenger. The dead man could not be seen from 150 feet up … and half a block away. He couldn’t even be seen by someone standing alongside the car. That’s because police had covered the body with a sheet, common at fatals. Aerial footage Pedro Rivera shot on Main Street in Hartford on 1 February 2014. The crash vehicle is on the right, parked on the lawn in front of a 3-story brick building. Rivera’s goal was to get some exclusive footage for his TV station, WFSB. It would be inexpensive material as well. In fact, his venture with a quadcopter was quieter, safer … and way, way, way cheaper than if the station had paid to put a chopper in the sky. Uniformed Hartford Police suddenly interrupted Rivera’s work. Officers surrounded the reporter and ordered him to take down his drone, claiming it was “jeopardizing officer safety” … and the integrity of the victim. 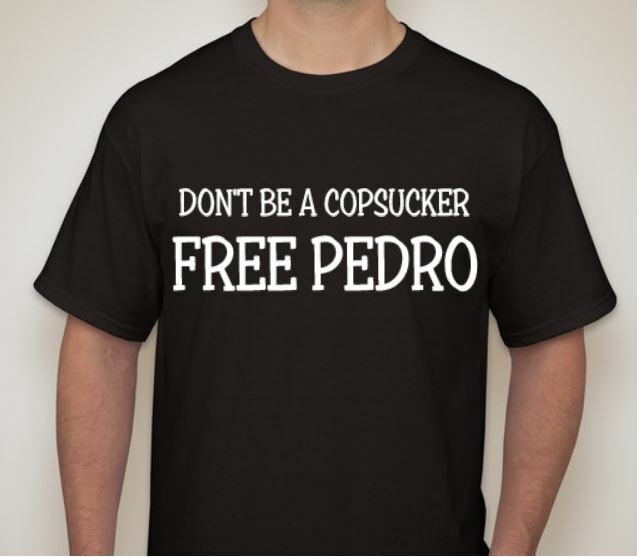 Police didn’t arrest Rivera, but they hassled him and essentially told him to go forth and multiply. The reporter went from yellow police tape to red tape. 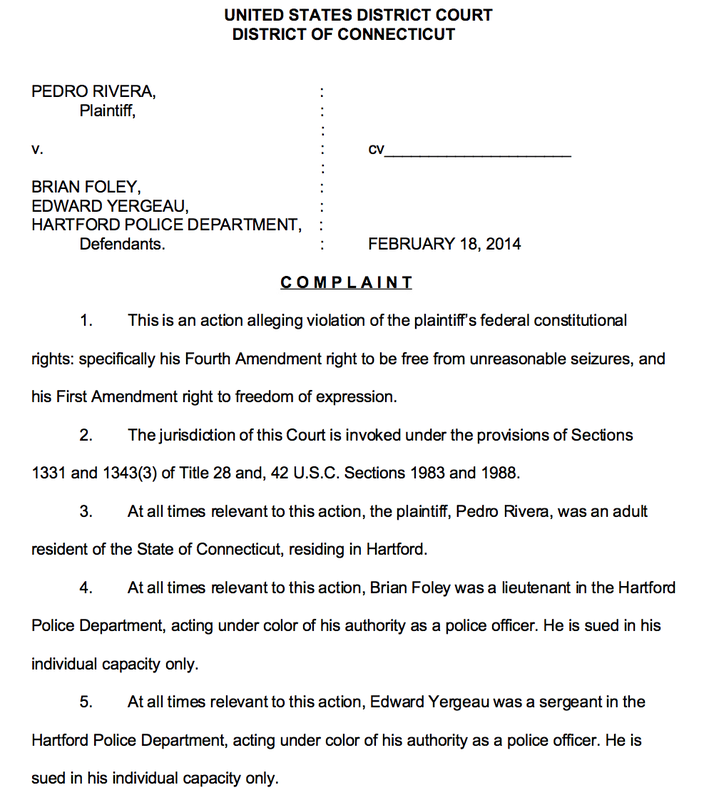 Officers then put in a phone call — behind Rivera’s back — to his employer, WFSB-TV, where he worked part-time. Their allegation was that Rivera had ‘interfered’ with a police investigation. A senior policeman asked station management to reprimand the reporter. Rather than break a national news story and give police a strong message about the need for an independent media, WFSB capitulated. Instead of praising its reporter for going the extra mile station management called Rivera into a meeting and told him to stay away for a week — without pay. Owing that the story has gone around the world [and embarrassed WFSB], Rivera’s punishment may be a lot more than one week of lost wages. 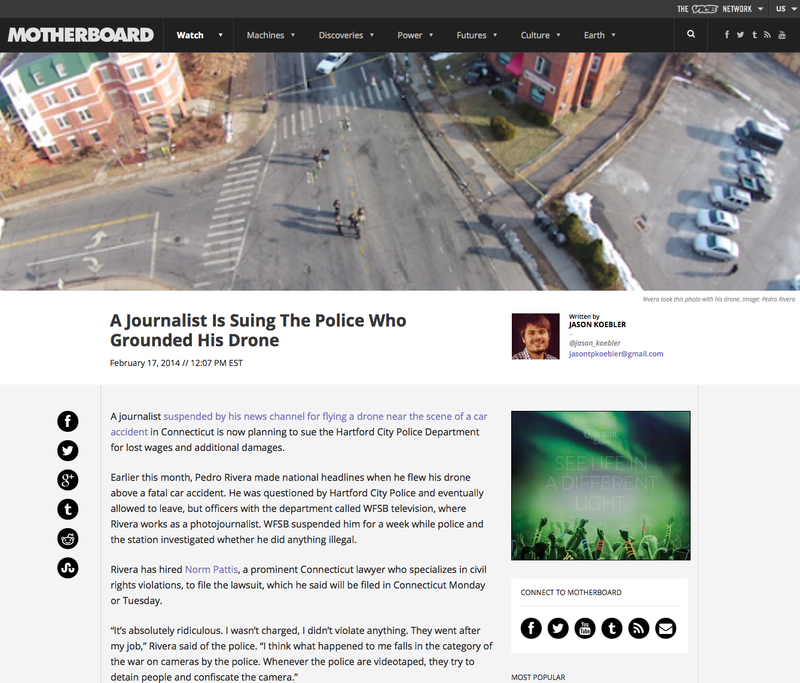 The journalist has not been called back since he was ordered out in the middle of his shift. That was more than a month ago. How’s that for distancing oneself from your reporter? No one ever claimed Rivera was on duty, or that he’d been assigned to shoot video that morning. That’s precisely the point. He was there on his own initiative, something media suits should appreciate. Pedro Rivera had gone from a high to a low: from seeing the roof of a sedan from 150 feet in the air … to a close-up view of the undercarriage of a bus. Where is the logic here? There is none. There are a couple of ironies, however: One, the story was broken not by WFSB, but by a rival, the local FOX outlet. Two, people living in the building where the accident happened or in the 4-story building across the street could have easily taken much better photographs. Officers might have also accused them of interfering with a police investigation. It gets worse. Mike Magnoli, a reporter with Fox CT [Connecticut], WTIC, was on scene with his camera-person. [Notice the politically-correct term] In fact, Magnoili was only 20 feet or so from the crumpled car. By then, however, the victim’s body had been removed and the injured taken to hospital. Police told Magnoli they believed the car had been speeding. No kidding. As in going like a bat out of hell down the street and failing to make a left turn at the T-intersection. One resident also wondered if the potholes on Main Street may have contributed to the crash. Hartford Police, including the Chief, will now have to appear before a judge and jury and explain their behaviour. If things don’t go their way, they may even have to pay Rivera some money, compliments of taxpayers of course. It all depends on how things shake down with a lawsuit filed on 18th February 2014 by legal Top Gun Norm Pattis. According to Pattis, Rivera’s right to monitor police response to a motor vehicle accident was violated [First Amendment], as well as his protection against unreasonable seizure [Fourth Amendment]. Page 1 of the lawsuit filed by lawyer Norm Pattis of Bethany, Connecticut. The lawsuit reads, “Private citizens do not need local, state or federal approval to operate a remote-controlled aircraft” … and that police had no cause to believe Rivera was “in violation of any law or regulatory requirement.” How Pattis puts it is that, “The plaintiff was standing outside of the area denoted as the crime scene by officers responding to the accident.” In other words, he wasn’t breaking any state or federal law. Rivera’s run-in with police morphed into an international story. It seemed that every major news organization covered it. Google ‘Pedro Rivera Hartford’ and you’ll see what I mean. Here’s a screen-capture of the story as it appeared in Motherboard, an online magazine and video channel “dedicated to the intersection of technology, science and humans.” The piece is written by science and technology reporter Jason Koebler. “I support the guy. It really bugs me that no one says anything when the news helicopters hoover at 1,000 or 1,500 feet to get aerials … but this poor guy at 150 feet, with a tiny electric helicopter, gets in trouble. 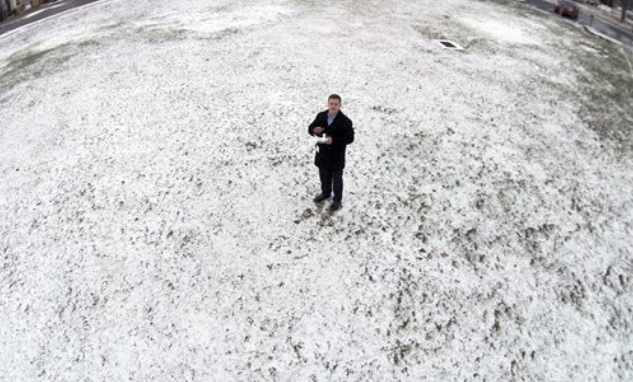 [with the] crazy wide-angle lens of a GoPro [camera] at 150 feet, you can barely make out anyone’s face. This dude broke no laws, yet had to lose a week’s pay because his employer got a little bit scared. Rivera never thought that his “going the extra mile” would become an international news story. Here’s a portion of the telephone talk we had on 25th February 2014 … note what Rivera says at the end. The clip runs 02:15. The kerfuffle over a reporter trying to get news footage with his private quad-copter brings to a head the issue of remote-controlled aircraft — such as the DJI Phantom, currently the most popular unit on the market. I own two DJI Phantoms, including the Vision 2, the same one Rivera was using. And, yes, I have wondered if I could get possible news footage with my machines. 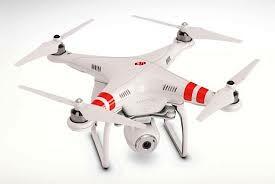 If I come across an accident scene or a fire, and if I’m not hindering anyone, why not get some aerial shots? I’ve had the Phantoms since last fall, and I can clearly see a need for regulations — especially as more and more people buy the devices. The Phantoms are a heck of a lot of fun, fairly easy to fly and while there are fly-aways [I’ve had three], one can get some clear, near broadcast-quality video. I’m not surprised they’re selling like hotcakes. These things are revolutionizing photography. Well. See for yourself. Check out this short, High Definition video clip shot by my Phantom 2 Vision over my neighbourhood in the west end of Edmonton, Alberta, Canada. This is raw video, mind you. It was shot on a slightly windy day in October 2013. I believe a vast majority of quadcopter owners are responsible and thoughtful, but assholes see them as a clever way to break the law. In Canada, a quadcopter has already been used to drop cigarettes behind a prison wall. At a prison in the U.S., a personal drone was used to fly in some dope. I know you’re thinking, “These ragbags behind bars … do they actually know ragbags on the outside?” Yup, they do. Retired television reporter Paul McLaughlin of Saint John, New Brunswick, wonders what would happen if the paparazzi had the quadcopters. “Imagine the paparazzi at an event with 50 overhead?” he writes. But back to Mr. Rivera. Good job for sticking to your guns, and shame on those at the television station who dropped to their knees when police contacted them. Pedro Rivera gives me hope that real journalism is still alive. The young reporter was only trying to earn his spurs. He used his own equipment, on his own time, showed initiative and demonstrated how he could help his media outlet in a competitive market. It was a tragic situation that was handled in a heavy-handed manner. Shame on those supine, grovelling goofs in management. Let’s end this post with a fun clip. The crew at Netflix did this parody on Amazon’s plan to deploy commercial, remote-controlled aircraft to deliver packages. The ones used in the production of this video are the original Phantoms, the Phantom One. Some good news for Pedro Rivera: The FAA determined there was no evidence that Rivera had operated his drone in a careless or reckless manner. 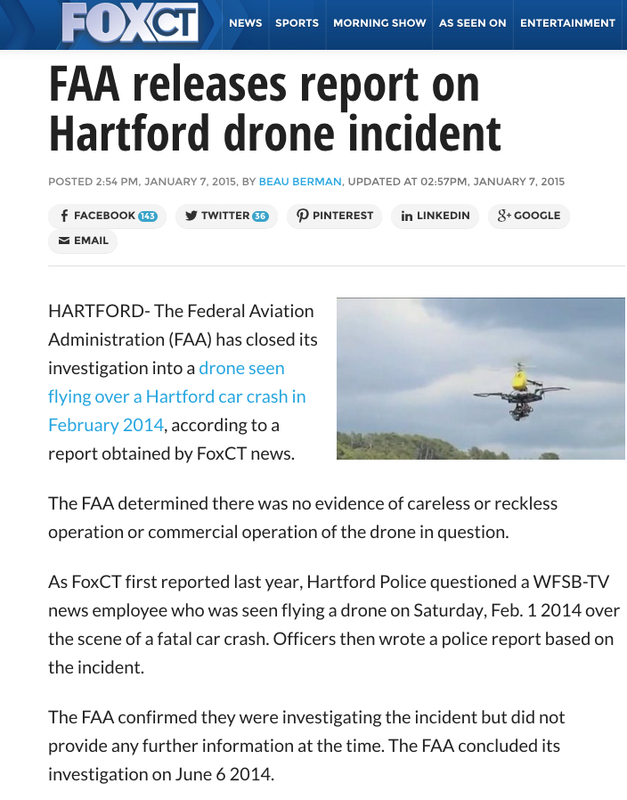 Here’s a 7th January 2015 report by Fox News Connecticut. This is an obvious act from the authoritarians to strike fear into the general public. No laws were being violated but anyone at an advantage over authority is a threat and will be dealt with. In this case, it was an economic punishment. We must see, hear and observe what the police, government and media want us to. I’m glad this individual is getting his day in court and has the courage to stand up against this ridiculous bullying by the police. When that nearly uncontrollable piece of plastic and metal with a history of falling [http://blog.al.com/wire/2013/10/drone_falls_out_of_the_sky_in.html, there are many other instances reported] from the sky weighing several kilos … and maims or kills someone, look me up, I will tell you I told you so. “It’s a fairly inexpensive device every radio, print and television newsroom should have.” No, they shouldn’t. It should be subject to serious control and law … or more and more people will be hurt. I CAN’T BELIEVE that his bosses caved to the police. There is NOTHING that I’m aware of that bars that. It actually could help the police because there are fewer people at their crime scene. Also, it seems the victims were simply civilians, not high-powered actors, politicians, etc. I’ve never heard of a news organization NOT backing their reporter, right or wrong. Reprisal in job security is quite often the norm in many aspects of show business when someone feels that one has “crossed the line” — whatever that line may be. I viewed the videos and the partial phone interview embedded in this item also. Really food for thought. I’m curious, has anyone shot one of these down yet over their own property? No, not kidding, in the scenarios posted above imagine a rancher spotting one carry in drugs across the border … or a perf drone peeping into one’s windows. What are the ramifications of shooting one down? If I saw one peeping into my daughter’s windows I certainly would attempt to interdict it. What about other countermeasures? Can one steal control by over-riding it with a transmitter in closer proximity? The young reporter should have gotten an “attaboy.” Instead a combination of authoritarian individuals (police) and cowards with no vision (WSFB) combined to create a stupid, illogical, unfair result.